When it comes to good food, Islanders and visitors have no problem finding good seafood spots. After all, this is the Gulf Coast, right? But a lesser known tidbit about our treasured island is that it’s also is home to some of the best hamburgers in the state. You just have to know where to look. The Spot is outdoor dining at its best, featuring one of Galveston's largest open air decks overlooking the beautiful Gulf of Mexico! This popular eatery offers gourmet hamburgers, fresh seafood, ice cream, fresh-baked desserts and bread, an arcade, and Tiki Bar. The Patio Grill builds the some of the best burgers you’ve ever had. They start with only the freshest ingredients and built it like a real burger should be. Make sure to make it a combo and try one of their famous shakes to help wash down arguably the best burger and fries on the Island. Hours: Wednesday-Sunday, 11 a.m.-0 p.m.
Cafe Michael Burger is a long-time Galveston beachside joint offering some of the best burgers and Gulf views on the Island on the wonderful open-air deck upstairs. Beyond a wide array of themed-burgers, the establishment also offers German favorites - think wienerschnitzel, bratwurst, red cabbage, fried potatoes and sauerkraut. There’s also a nice selection of American and German beers for the perfect ice-cold accompaniment to your meal. Open 11 a.m. - 9 p.m. The Hubcap Grill is the place to grab a burger to remember. The famed Hubcap Burger comes with two fresh ground beef patties layered on toasted buns with American and Swiss cheese topped with lettuce, tomato, pickles onions and our special mayo sauce. Or try the Triple Heart Clogger, which comes with a fresh ground beef patty, grilled weiner, bacon and cheese. Or the Quadruple Heart Clogger, a fresh ground patty, with grilled weiner, bacon, chili and cheese. 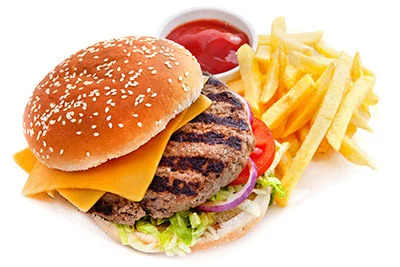 Check out the full list of burgers online. Open Sunday thru Thursday: 11 a.m.- 9 p.m.
Fuddruckers in Galveston is a great place for lunch with co-workers, for a birthday-celebration dinner, or as your date-night destination. What makes the island location extra special is its location in the 1912 Armour & Co. building at 101 23rd Street. The prime downtown “Strand” district location is also Fuddruckers only three-story venue and offers a full bar. You know how they say, "When in Rome"... Well, when you're at Fuddruckers, you've got to try a Fudds Burger. Order yours in 1/3 lb., 1/2 lb., 2/3 lb. or 1 lb. patties, add your favorite produce – like bacon, cheese, sautéed mushrooms, grilled onions and guacamole. Then sit down and relax while the grill master cooks your burger to perfection and places it atop a Fuddruckers scratch-baked bun. Enjoy your burger on the first-floor terrace, and there’s spacious patios on the second and third levels overlooking The Strand and the Galveston Harbor. When it comes to good burgers and island-style fun, grab the sunblock and sunshades and head over to Float, which features an indoor air-conditioned bar overlooking the Gulf of Mexico, as well as an outdoor pool in which to cool down during the warm summer months. Float also features live bands throughout the year.